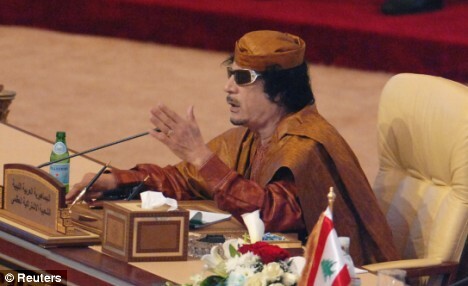 "I'm the King of Kings"
No wonder Libyan leader, Col. Muammar Gaddafi, likes Obama so much. Both are Muslim dictators. When his Qatari hosts tried to quieten him down, Gaddafi – the current chairman of the African Union – insisted he would not be silenced. ‘I am an international leader, the dean of the Arab rulers, the king of kings of Africa and the imam (leader) of Muslims, and my international status does not allow me to descend to a lower level,’ he said. He then got up and walked out of the hall. A Libyan delegate said he went to an Islamic museum for a tour. Gaddafi ended Libya’s decades of international isolation in 2003 when he gave up its pursuit of nuclear arms and renounced terrorism. He has harboured a grudge against King Abdullah of Saudi Arabia since they exchanged harsh words in early 2003 over the imminent U.S.-led invasion of Iraq. ‘Now after six years, it has proved that you were the liar,’ Gaddafi told Abdullah yesterday. He added that the Saudi ruler was a ‘British product and American ally’. Last year, Gaddafi poured contempt on fellow Arab leaders at a summit in Syria, warning they might be overthrown like Saddam Hussein. He boycotted a 2007 summit in Saudi Arabia, claiming ‘Liza’ – referring to former U.S. Secretary of State Condoleezza Rice – had dictated its agenda. Prior to the US election, Gaddafi endorsed Obama for President, emphasizing his ‘Kenyan’ origins and Muslim religion.